KHOST, Afghanistan, September 8, 2014 (ENS) – For hundreds of years, people in Afghanistan have stockpiled winter snows in specially-dug pits so they can use it during the scorching summer months. Now, residents and officials in the mountainous southeastern province of Khost say storing and selling snow could provide a viable alternative to the illegal logging which has severely depleted local forests. 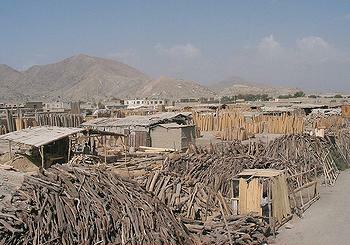 Deforestation is a major problem in Afghanistan. More than 30 years of conflict has left woodland areas devastated as people cut timber to sell or use themselves. Many loggers say they have no other means of earning an income. Zadran added that the tradition of livestock raising has suffered as soil damage caused by deforestation means there is nowhere left to graze animals. Fateh Khan, a resident of Mangal district, said that he is one of many people in the area who have abandoned illegal logging in recent years to store and sell snow. He now transports and sells several truckloads of snow to the provincial capital every year, and says the business is going well, with last season particularly profitable. “Previously, I would cut down trees in the forest and sell the timber, but I wouldn’t make as much profit as I make selling snow. I make 10,000 to 12,000 dollars profit every year in the snow business,” Khan said, adding that although the work was hard, it was preferable to chopping wood or having to seek employment abroad. In Khost province, about half the 1,300 square-kilometer forested area has been lost, and the situation is particularly bad in the Tanay, Spera and Musa Khel districts. Agricultural and environmental protection officials in the province estimate that the pace of deforestation could be slowed by between 10 and 30 percent if people in mountain areas turned to selling snow, and they want a national strategy to be put in place to promote this. “The government can easily create reservoirs [for snow] in Khost, Paktia, Paktika and the northern provinces and expand the business. It will prevent deforestation,” said Khost’s director of agriculture Niaz Mohammad Lali Zadran. To illustrate the severity of the problem, Zadran pointed to a survey carried out by German experts which found that in Khost, Paktia and Paktika provinces have lost nearly 75 percent of the forested area recorded in 1978. Although the Afghan constitution says that forests belong to the state, stopping over-exploitation of them becomes almost impossible when the government’s reach is limited. Local officials say they are trying a number of tactics to discourage illegal logging. Fazlullah Fazel, director of the Khost customs department, added that to discourage over-use of forests, an extra tax of US$2 per meter was levied on timber used to make doors and window frames. Firewood, however, was exempt from this, and continued to be exported from Khost to Ghazni, Logar, Kandahar and many northern provinces as well as to the capital, Kabul. “We have met district councils, civil society institutions and some other bodies in this regard and the work is still in progress,” said Barialai Rawan, head of the public relations department at the Khost governor’s office. He noted that the security forces had arrested a number of people for illegal logging, but said they had been released after tribal elders interceded on their behalf. They then pledged to stop the practice. Traditional mechanisms are not strong enough to deter logging, though. An elder in Musakhel district, Omar Gul, said tribal leaders tended to put personal interest over benefits to the community. 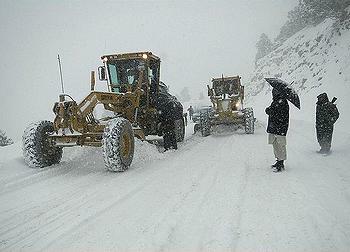 Snow can be exploited without causing any environmental problems. Khost residents told this reporter that natural snow, stored in pits up to eight meters deep, was superior to factory-produced ice. As well as being cheaper, the flavor was better and there was a lower risk of contamination. A resident of Khost City, Musa, said that he bought factory-produced ice at the beginning of summer until he and his children became ill with fever, coughing and sore throats. A doctor advised him to switch to natural snow. Demand for snow is high and business is booming. Zalmai, a motorised rickshaw driver, buys up to 10 loads of snow in Khost City every day and drives it out to sell in the countryside.